Feather-light 100% vegan nourishing treatment featuring a proprietary blend of exclusive oils including Camellia Oil from Japan and Abyssinian Oil from Africa, with seaweed and vitamin E, instantly defrizzes and infuses hair with astonishing smoothness, extreme shine, and unsurpassed color and thermal protection, while returning hair to its healthiest condition ever. Never greasy or staining, this clear miracle-in-a-bottle takes shine and smooth to the max without the use of sulfates, salts or gluten. Usage: Apply a small amount to clean, damp hair. Style. Apply small amount to dry hair for maximum shine. 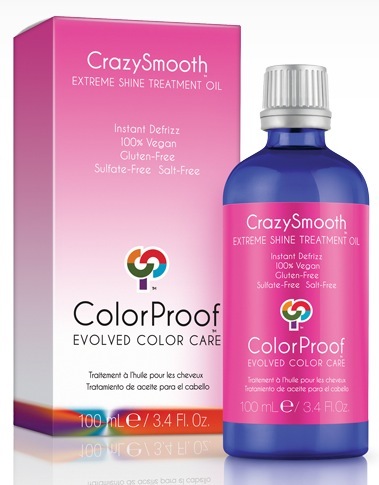 Combine CrazySmooth Extreme Shine Treatment Oil with PlushLocks Leave-In Smooth for extra conditioning, smoothing and long lasting frizz control. Fuse CrazySmooth Extreme Shine Treatment Oil with HeatProof™ Anti-Frizz Blow Dry Crème, PerfectPlay™ Style Gel or any of your other favorite ColorProof styling products for unstoppable shine and superior smoothing and defrizzing with maximum style. Picture shown is the 3.4 oz. bottle. You are ordering the .34 oz. bottle.